Thinking about joining our club, then please read below. This is compiled from questions we have been asked in the past and should help you with what you need to know about Barton & District Athletics Club. The senior section concentrates mainly on road running but also encourages participation in athletics events where seniors are interested. The senior section is for anyone aged 18 and over, there is no upper age limit. We cater for all levels of abilities and fitness, many of the older members being far fitter than some of the younger members! If you want walk/run at a social level or run in competitions the club is for you. Come join us! Do you have women in the club or is it just men? Yes, the make up of the club is about 50/50 female/male members. I am a beginner, is the club for me? I am not that fast, will there be anyone to run with me? We have members at all levels, from those who walk/run to those at a faster completion pace. We split runners into different pace groups, led by run leaders, to ensure all our runners are supported appropriately. Where do you meet and at what time? We meet at Baysgarth School, Barrow Road, Barton on Humber, North Lincolnshire, DN18 5DZ at 6.30 p.m. every Thursday. There is car parking space available at the school. It is not necessary to attend every session, just come along. Do you meet at other times? Do you have runs at the weekend as well? There are various runout sessions mainly on Tuesday evenings and Sunday mornings , arranged by individual club members. To find out about these visit our Facebook page, including where to meet and at what time etc.. All are welcome to take part in any of these but please note the pace and distance that these sessions will be run at - check with the individual organiser for details. There is also a speed session organised for most Tuesday evenings, often at Costello track in Hull. Again details for these are posted each week on our Facebook site stating where to meet and at what time. How far do you run durning the week? We usually run for about 1 hour on a Thursday and the distance varies. We try to encourage all to take part in specially designed interval or speed training to help improve running abilities and capabilities. However there will be also be groups, split by pace/distance, led by run leaders who just do a runout. This may include a beginners group who may at the beginning do a steady walk. Activities are individually arranged on other days ranging from walks (followed by coffee and cake - our club is well noted for its social side) to those training for Marathons etc. doing distances between 6 to 20 miles. What races do you compete in? 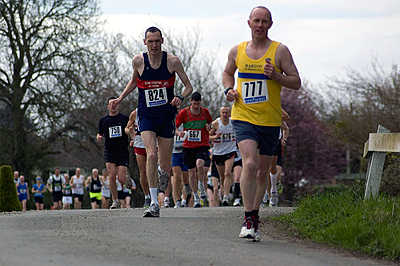 We have a Club Handicap that runs from January to December to encourage members to take part in organised races in the Yorkshire & Lincolnshire region.There are prizes for the most improved runners during the year. We also join in Park Runs in Hull, Scunthorpe and Cleethorpes. The aim is to encourage all to take part, improve and reach their personal goals. However we are a very relaxed club so you decide what to get involved in, if anything. You will find the “Barton barmy army” very vociferous in their support, helping all who take part over the finishing line. Loudest cheers for those doing their first races and maybe being towards the back of the field. That said we also do like to win, so the more competitive amongst us take great pride in bringing the Barton vest home ahead of other local clubs! We currently take part in an inter-club team challenge with Scunthorpe, Wolds Veterans and Gainsborough. How do I know where and when you are racing? Do you have a home event each year? We proudly host the “Deepdale Dash”, run the first Sunday in November each year. Voted the 3rd best 10k in the whole of the UK it is an exciting and undulating course around rural Barton with some 400 entrants taking part. We also host the annual Barton & District AC cross country - now in its 35th year. This is probably now the largest open event of its kind now in the Yorkshire & Lincolnshire region. What if I want to take part in track or field athletics? The club has a growing number of adults who are regularly competing in track and field events at both club and county level. As a club we encourage all adults to take part and train in any events that they feel confident to take part in. At all times each adult is under the supervision of a trained coach. Sounds good to me what do I do now? Copyright © Barton & District AC. All Rights Reserved.